In strip trials conducted in Wabasha, Winona and Brown counties, we applied combinations of nitrogen, phosphorus and sulfur in a band, two inches beside and below the seed row. Fertilizer combinations including sulfur increased soybean plan height and biomass. That increase biomass could lead to greater disease pressure from a fuller canopy and higher drought impact. Results from this study show that soybean can respond to sulfur, but presents and increased risk for excessive biomass. Additional research in Lamberton showed little benefit to sulfur application regardless of tillage system used. Corn grain yield increased more consistently in no-till or strip till systems but soybean yield was not affected. We conducted separate trials at Becker, Lamberton, Red Wing and Rochester and found some grain yield benefit to soybean with sulfur applied ahead of a previous corn crop. Soybean grain yield increased in a study near Red Wing and Rochester from two to six bushels per acre in plots with sulfur applied ahead of corn. Based on these trials, we see that soybean will respond to sulfur fertilizer, but in isolated circumstances. Suggested rates of sulfur application for corn have shown to also benefit soybean the following year without applying sulfur to the soybean crop. Soybean tends to scavenge and recycle sulfur better than corn. 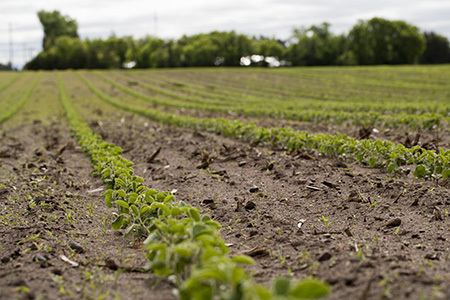 The only circumstance that we would suggest sulfur applied directly to soybean is with newly purchased or rented land where you do not know the past fertilization history. When you do apply sulfur, consider products like potassium sulfate and gypsum, which are likely reduce the risk for excessive vegetative growth and potential yield reductions. When applying sulfur it is best to target crops more likely to be deficient. In Minnesota, deficiencies are most likely to occur in canola, alfalfa, and corn.